Ursanne Loche is a Breton commoner living in Bravil. Her husband Aleron recently began to gamble heavily, resulting in him borrowing money from usurer Kurdan gro-Dragol in order to make up for his losses. He never came back from his last visit with Kurdan and, as such, Ursanne will request your help in finding him. Despite all the turmoil that has entered her life due to her husband's disappearance, Ursanne tries her best to live a normal life. She begins her day by waking up at 4am and having a three-hour breakfast. After finishing her meal, she will unlock the door for any potential visitors and will then simply wander around her house for the next five hours. At noon, she will leave her home to head to the Great Chapel of Mara where she will sit at one of the pews and read for the next six hours. After completing her afternoon of worship, Ursanne will leave the chapel at 6pm to take a walk around the northern part of Bravil. She will wander around this area until 10pm at which point she returns to her house. She will then simply stroll around the house for two more hours before going to bed at midnight. She wears a pair of belted braies, a belted vest and a pair of sack cloth sandals. She carries a loaf of bread, a copy of Gods and Worship as well as the key to her home. In conversation or when asked for rumors, you may overhear the citizens of Bravil say, "I overheard someone say that Aleron Loche is missing. I don't know what happened to him. His wife, Ursanne, is beside herself with grief." Additionally, the innkeeper of the Lonely Suitor Lodge, Bogrum Gro-Galash, will mention that Aleron is missing when asked about Bravil: "A local woman, Ursanne Loche, has a missing husband. She might appreciate some help from someone like you." Should you then ask about Aleron, the citizens will say, "Yeah, Ursanne's husband, Aleron is missing. Poor thing, I've seen her crying at the chapel. I hope someone can help her." Should you seek Ursanne out, when you approach her she will politely say, "Excuse me, my lord/lady." She will then ask you to help her find her husband: "I'm sorry to impose upon you like this, but I'm in need of assistance, and I don't know what to do. My husband, Aleron, is missing." If you end your conversation with her before hearing her out, she will bid farewell with a simple: "Farewell." When you approach her again, she will be even more direct than the first time you met her: "I really need your help." before then repeating her initial plea for help. Once you ask her about Aleron, she will provide you with the story about how Aleron got into trouble: "It all started when Aleron became foolish, and started gambling. He'd visit the arena every week and spend our hard earned money on bets. I told him to stop, but he didn't listen. He was certain he could win us a fortune and move us somewhere nicer, like the Imperial City. It didn't take long for Aleron to begin losing. He resorted to borrowing money from a usurer to cover his losses and place new bets. As you can imagine, it didn't pay off. He ended up owing around 500 gold. We could never have that kind of money to pay back the usurer." At this point, you can ask what happened to Aleron and she will say, "Yesterday, the usurer, Kurdan gro-Dragol, sent for my husband to meet him at the Lonely Suitor Lodge. He hasn't returned since. I fear for his life. Kurdan isn't known for his patience. Please, I'm not wealthy, but I'd give anything to see Aleron again." After she has finished her story, you can tell Ursanne that you'll help her. She will be relieved to hear this, saying, "You... you will? Oh thank you! Please be careful, I don't wish any harm to befall you either." She will urge you to be cautious when you end your conversation with her: "Farewell, and be careful, Kurdan is not to be trusted." Once you have agreed to help her find Aleron, she will now greet you by asking, "Any word of Aleron?" She will then say that there is not much more she can tell you about the situation: "I'm afraid there isn't much else to tell you. Just be careful." She will also have this to say about Aleron: "I do miss him so. And when he gets back, I'm gonna kill him for making me worry like this!" After you have met with Kurdan, she will sense that you have news about her husband, saying, "I'm hoping you bring me good news." After learning about what has happened to her husband, she will urge you to rush to his aid when you ask about him: "I knew it! I just knew he's gotten himself in hot water again. Please hurry and get him from that island." If you ask her about the Axe of Dragol that Kurdan requested you to find, she will confusedly say, "Aleron never mentioned it to me before." After you have traveled to Fort Grief and located Aleron, you will learn that Kurdan tricked both you and Aleron into being part of what he calls the Hunter's Run. Kurdan uses the fort as a location for this game where clients pay gold to hunt and kill human prey. Aleron will ask you to help him get off the island by defeating the hunters, mentioning that he just wants to go home and see his wife again: "I only wish to return home and be with my wife, Ursanne." Despite your efforts in successfully defeating the hunters, you will see Kurdan mercilessly kill Aleron as soon as you exit the fort with the key to leave. After killing Kurdan to obtain the real key to the fort, you will then have to head back to Bravil and deliver the sad news to Ursanne. Seeing that Aleron is not with you, she will sense that something is wrong when you approach her, saying, "I fear grave tidings." She will then ask you what happened to her husband: "Something's wrong... I can tell. What's happened to Aleron?" When you apologize and say that he is dead, she will become deeply saddened but will manage to ask what happened to Kurdan: "When I saw the grave look on your face, I knew something had happened to him. And what of that fetcher, Kurdan?" Telling her that he lives no longer will bring Ursanne some peace: "Then Aleron's death has been avenged. I told him that the gambling would lead to this, that foolish man. But he never listened." 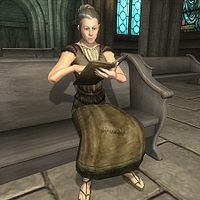 She will then hand you a copy of the Speechcraft skill book Biography of the Wolf Queen and continue by thanking you for your help: "Before you go, I have this for you. Aleron told me that if he ever got in trouble, this could be used to bail him out of jail. He'll... not be needing it any longer, and I want you to have it. I'll not take no for an answer. I know you did all you could, and for that, I thank you. Now, please... go in peace. I wish to be alone." After completing the quest, or if you failed it by killing Kurdan or Aleron prematurely, she will be heartbroken over the loss of her husband and can often be heard saying, "Oh my poor Aleron..." If you try to talk to her, she will only express her desire to be left alone: "Please. I wish to be alone with my thoughts." She will then immediately end her conversation with you. Dialogue exists in the Construction Set for Ursanne to say if you fail the quest by having Kurdan or Aleron be killed before the proper quest stages. However, it cannot be heard in normal gameplay as the above dialogue for when you complete or fail the quest takes precedence. When you approached her, she would have said, "Aleron... my sweet husband..." Then, if Kurdan was killed prematurely, she would have angrily said, "You idiot! How could you kill Kurdan before you got Aleron to safety? Get... get out of my sight!" Ursanne also has two unused farewells that cannot be heard in normal gameplay as you cannot voluntarily exit dialogue with her during the quest stages in which these lines could be heard. If you exited dialogue after returning from Fort Grief but before telling her that Aleron has been killed, she would have said, "Go in peace." After completing the quest, she would have wished you well when you exited dialogue: "May Mara guide you in your travels."